A popular method to create a macro is to use the Macro Recorder. When you use this tool, you show Excel (by clicking on different elements in the application) the sequence of steps that it needs to perform each time you execute the macro. Excel records every move you make, including actions such as scrolling, clicking cells and so on. You should have your moves planned in advance when you record a macro, otherwise, you will have a lot of unwanted code. In the first method, click the button in the lower left corner of the worksheet. If you don’t see this icon, right-click the green area and make sure that the Macro Recording position is checked. Another method is to choose VIEW >> Macros >> Macros >> Record Macro…. When you use one of these methods, a new window will appear. Here, you can change the macro name and add a description. You can also create a shortcut key, so you will be able to execute your macro instantly. 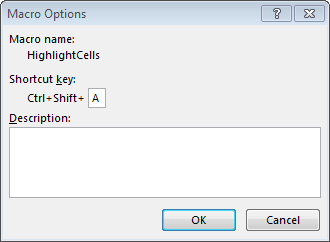 When you create a keyboard shortcut to your macro, you may want to consider using the Ctrl + Shift + letter because many keyboard shortcuts with only the Ctrl key already taken. If you choose the shortcut that is already used in Windows, it will override the default one. For example, if you use the Ctrl + N shortcut for your macro, this shortcut will only be used to execute this macro, unless you change it in VIEW >> Macros >> Macros >> View Macros >> Options …. At first, it may seem that all cells, instead of D4 are numbers. But when you use the Ctrl + ` shortcut, you will notice that in fact only some of them are numbers, other are text and formulas. Let’s suppose that you want to create a macro that will apply to each type of data (numbers, text, and formulas) a different color. Because the macro recorder records your every move, you don’t want to remember moves that are not necessary. In this example we will work with the HOME tab, so make sure that you have this tab already opened. 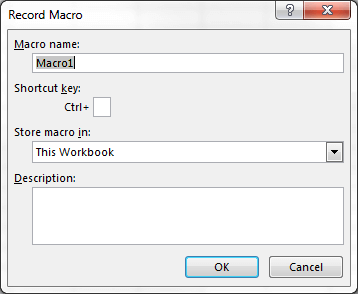 Click the record button, name your macro and apply a keyboard shortcut. Then choose HOME >> Editing >> Find & Select >> Go To Special and select Constants >> Numbers. After you click the OK button all the numbers become selected. Select HOME >> Font >> Fill Color and choose yellow color. Click outside the box to unselect cells. 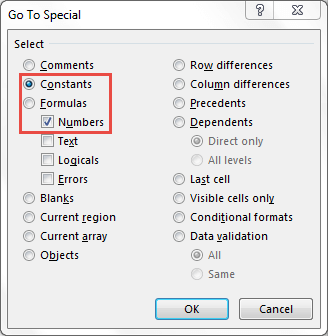 Click Go To Special and this time select Constants >> Text. Select a green color and click any cell outside the area. One more time go to Go To Special, select Formulas and check numbers. Click OK and apply blue color. Click the Stop icon to stop recording the macro. If you did everything correctly, you should see the following result. Click a blank cell and select Format Painter (HOME >> Clipboard >> Format Painter). Select all highlighted cells to remove formatting and align them to the right. Go to VIEW >> Macros >> Macros >> View Macros. Select the macro and click the Run button. Use the shortcut key (if you defined it in the Record Macro window). Go to DEVELOPER >> Code >> Macros. As you can see with this macro all the highlighting can be done with just a single click. In order to preview the code generated by the macro, use the Alt + F11 keyboard shortcut. Opening and closing of the subroutine. These lines are comments. Here, by default, you can find the name and the keyboard shortcut you assigned to the macro. You cannot change the keyboard shortcut simply by changing the text in comments, instead, you have to go to DEVELOPER >> Code >> Macros. Select the macro and choose Options. Change the shortcut key to the new one. This code was created when you chose HOME >> Editing Find & Select >> Go To Special … three times, selecting constants numbers, constants text, and formulas numbers. Here, you apply the instructions saying that the cells are to be filled with the solid color. .PatternColorIndex = xlAutomatic means, that for the selected cells there is the specified automatic pattern to draw objects and fill cells. When you chose the yellow color, Excel automatically created this line of code: .Color = 65535. That’s the index number of yellow color. You can also specify the yellow color by using: .Color = RGB(255,255,0) or .Color = vbYellow. you can assign a number between -1 (darkest) and 1 (lightest). We don’t want any tint and shade, so set them to 0, which is neutral. In VBA, you can’t select particular cells, only ranges. Range(“G8”).Select means that Excel selects range G8, which is the same as cell G8. You can choose any cell, not necessarily those selected in the code. This code is used only to deselect the cells which you selected before to apply colors. You can select only one cell, even in searched cells. Remember not to select multiple cells. If you do this, Excel will start looking only inside the selected range and not in the entire worksheet. By default, Excel records a macro with absolute references to cells. But sometimes you may want to create relative cell references. Please keep reading to see how these two methods differ from each other. Go to DEVELOPER >> Code >> Record Macro and name it „Absolute”. Click OK to start recording. Select cell A1 and type „Mon”. Select cell A2 and type „Tue”. Select cell A3 and type „Wed”. You can select any cell, but when you execute this macro you will always get „Mon” in cell A1, „Tue” in cell A2 and „Wed” in cell A3. Let’s see how the relative macro recording works. Make sure that DEVELOPER >> Code >> Use Relative References is highlighted. Go to DEVELOPER >> Code >> Record Macro and name it „Relative”. Click OK to start recording. Select the cell below and type „Tue”. Select the cell below and type „Wed”. Click the cell where you typed „Mon”. If you execute this macro in cell C5, Excel will insert „Mon” inside the active cell (C5). VBA moves the active cell one position below- to cell C6. The active cell is moved up by two cells, to cell C5. If you didn’t start with cell A1 as a reference, it may seem strange that Excel generated such code. This is just the way that macro recorder works.